THE RELIABLE SOURCE FOR ALL CHAIN REQUIREMENTS! Innovation, Quality and Design in manufacturing of Jewellery Chains, necklaces and bracelets in gold, platinum, silver, stainless steel, titanium and non-precious materials. Schofer meets all the needs of the processing industry with an extensive selection of surface finishes, clasps and logo tags. Individual customer requests can also be realised (OEM). Schofer Germany is certified for the Reponsible Jewellery Council (RJC) and ISO 9001:2015. 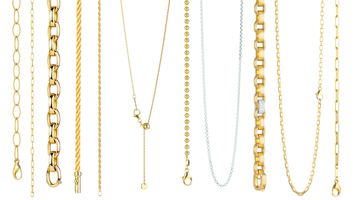 PERFECTLY SHAPED GOLD En vogue - square or navette shaped chain links. Gold is always a precious companion. Whether crafted by hand or machine - fine details make the difference. The combination of white gold with white paint and diamond cut is exciting. 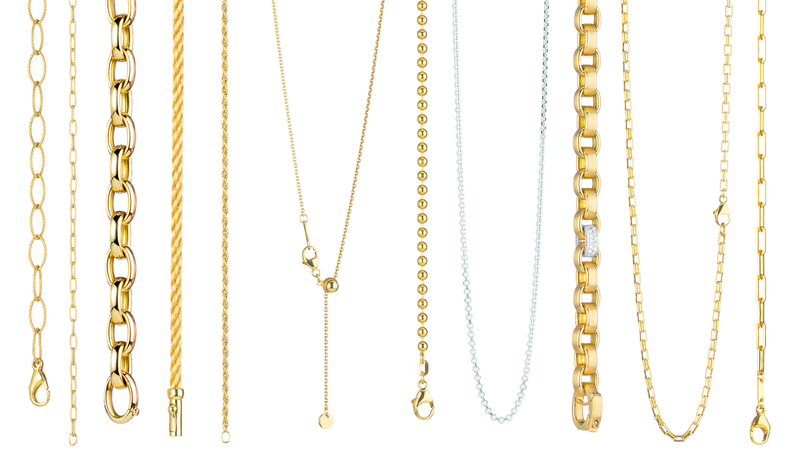 GOLD IN ITS MOST BEAUTIFUL SHAPE Lovingly hand-crafted by Schofer’s highly qualified chain goldsmiths. The new PRESTIGEline collection features classic models as well as new shapes with an edgy look. Always made from 18ct gold and most pleasant to wear. MEGA TREND METALLIC LOOK Colored PVD coatings give steel, titanium or silver chains an interesting metal look. Whether on matte or gloss surfaces: optimal permanency ensures the absolute glam factor! Let yourself be wowed by the new colors. WIRE WITH CHARACTER! Small structures create a huge impact: whether rolled-on or hammered onto an evenly wire - unique exemplary designs are created. Oxidised surfaces increase the textile effect. Special prototyping for OEM customers can be arranged. Wide selection and high quality for processing manufacturers. Chains sold by the meter in precious and non-precious materials. Suitable clasps, push-buttons, sliders, end caps and eyelets are available for jewellery production. Whether manufactured in fully automated production and/or traditional craftsmanship - the Schofer development team is constantly developing new designs, but also professionally executes the most sophisticated and exclusive customer wishes (OEM). Schofer Germany - WIRE WITH CHARACTER! Schofer Germany - PUSH, SLIDE AND ADJUST! Schofer Germany - COLOR YOUR LIFE!